We are sharing some extracts from our broader market outlook report shared with our clients. The high PE levels are an indication that the market is expecting a 14% growth to come soon. Q3FY18, Q4FY18 maybe? This expectation has been around from a couple of years now with no end results. Structurally India is getting ready for this kind of growth rate as deleveraging of corporates by loan waivers, creation of demand for capital expansion spending and rising consumer spending power will push up our economy to the next level. The earnings have started to show early signs of recovery and we expect it grow well into the couple of next quarters. For FY2018 we expect the earnings to grow at 8% p.a, thus the expected EPS of Nifty comes to Rs 408 per share. At current levels of ~9420, the forward PE is 3.11 which is EXPENSIVE. While on a PE basis we are at expensive valuations, other factors don’t point to an overvalued market as you will read below. On a price to book basis, we are nowhere near historical highs. At current PB ratio of 3.60, we are trading marginally above the long term average of 3.53. Despite not being at historical highs, we see many companies commanding undeservingly high price to book ratios. We are attaching a chart for your reference. As the chart shows, we are nowhere near the high valuation levels of 1999 and 2008. Over the next few weeks, we will try to share with you reports on stocks that are trading at expensive valuations and which could see some deep correction going forward. Another key ratio to look at when judging the market valuations is the dividend yield. On the dividend yield front, we are nowhere near the “bubble era” lows. A DY ratio below 1 will trigger red flags and as of now we are trading at a premium DY of 1.22, well below the average of 1.45. The chart can give you a visual representation of what we are trying to convey. Overall, on these three ratios, we are trading at the highs of the last five years. Post 2011, this is the highest point. While we don’t foresee a meltdown similar to the dot-com and 2008 crisis, a correction is very much on cards. A correction need not be only price correction but can also be a time-wise correction. In a price correction, we see the price of assets fall. However, in a time – wise correction, the price stays in a range for a very long time till fundamentals catch up. Infact, at times, well beyond that. The new era of investors has not yet seen testing times in the markets. Sure, we have seen dips of 10% to 12% but none of these have lasted for even a few months. We have become too used to the markets bouncing back. In this age of fast money, let’s keep our long term equity portfolio focused on generating good returns consistently for a long period of time. With the P/E level crossing 24, far too much comparison is being made to 2007. Let’s debunk some myths and ward away your fear of a meltdown. A meltdown is not a crash. Why are only these factors taken into consideration? Let’s talk in detail. 2) Money is cheap. Look at how low the US FED rates are! At a rate of 5.25% if PE is 28.25, then a PE of 25 is actually cheap for a FED rate of 1%. The inverse of PE (1 / PE) is the earnings yield. In 2007, the safest asset class was yielding you higher returns than equities! That itself is a proof that investors are paying a very high premium for equities – Overvaluations. 3) Indian corporate earnings are nowhere near a peak. What is missing is growth. And growth has been absent for quite some time now. A big reason for this is the NPA issue which has dragged down the credit growth. Now banks lend money to corporates and they use it to increase capacity and thus push up earnings. The market capitalization of India was close to $2 trillion back in 2007 on a GDP of $1.2 Trillion. Now again, roughly we are at a market capitalization of $2 Trillion on a GDP of $2.23 Trillion. The market capitalization to GDP was 1.5 in 2007 and just 0.88 now. 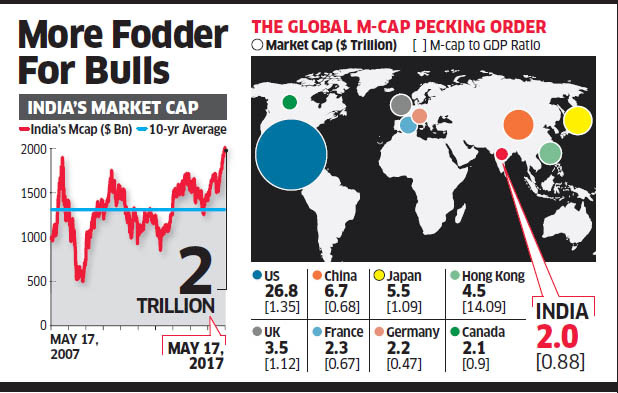 In the long run, if India’s GDP is to be $10 trillion in size, the market capitalization on a conservative basis will be $9 Trillion which is almost 4.5 times the current size. Now by when will this happen? 2030 or 2035, Who knows? Even knowing this won’t guarantee you doubling your investments in every 4 years. We are designing portfolios for our clients irrespective of Nifty PE. For example, Shakti Pumps has almost doubled since our BUY recommendation despite the market being “overvalued” then as well as now!